I haven’t been getting enough sleep lately. Last night I was exhausted in body and mind, but tried to keep my eyes open to follow updates on the Palestinian prisoners’ conditions. My heart and mind were with them completely, in every corner of the horrible Israeli prisons where our heroes continue to display persistence and steadfastness. Deciding to rebel against the cruel conditions they could no longer endure, hundreds of prisoners started a hunger strike on 27 September. Approximately 6,000 detainees inside Israeli prisons are forgotten about and treated as if they are less than animals. Israel, which claims to be the only democracy in the Middle East, seems to forget that prisoners are humans and have rights. The Palestinian prisoners are on hunger strike in the hope that Israel will grant their simple demands. But while they are calling in loud voices for their rights, Israel is reacting negatively, using every method it has to force the prisoners to give up. Prisoners are being sent to isolation cells in increasing numbers, family visits and lawyers are being denied, families threatened, and identity cards, belongings and clothing confiscated. This is all in addition to the constant torment they already have to endure. Israel is violating international law and nobody is stopping it. Oh, pardon me for forgetting that Israel is beyond any law! Approximately 285 Palestinian children are currently imprisoned, and the world is still silent. Nobody will dare challenge Israel. I am very emotionally attached to the prisoners’ issue, especially their hunger strike, not only because I am Palestinian but also because I am the daughter of a released prisoner. I was brought up hearing my father’s sad stories, full of suffering and despair, which remain stuck in his memory and will never leave him. My father’s eyes would have never seen the sun if Ahmad Jibril of the Popular Front for the Liberation of Palestine — General Command (PFLP-GC) didn’t manage to make a deal exchanging three Israeli prisoners he held captive in 1985, in return for the release of 1,250 Palestinian political prisoners. My family was watching the news concerning the current prisoners’ hunger strike when Dad started telling us about his imprisonment, which lasted for 15 years. Thinking deeply about my father’s words, and trying to imagine the awful conditions of the Palestinians inside the merciless Israeli jails, broke my heart. All the unbearable treatment prisoners endure is totally unfair and against humanity. Before I wrote this article, I took part in a Gaza City demonstration in solidarity with these prisoners, whose health is getting worse every day, but who will bravely continue. I was lucky to not have early lectures at university, so I could be there at 9:00 am protesting against the situation facing our prisoners. I had some conversations with other women protesting there, too. Most of them were either released prisoners or had sons, brothers, or husbands in prison and on hunger strike. She kept describing to me how hard it was to be alone without her husband taking care of six children, and how much she suffered and endured to make her husband, sentenced to lifelong imprisonment, proud of his children when he hopefully someday gets his freedom back. “I was very young, only 24 years old, when he went to prison. I stayed in this state of a married woman who has to live without a husband for 26 years for my six children. Thankfully, I now have 25 grandchildren,” she said proudly. Then she burst out crying, and said that she was worried because she heard that the Israeli army attacked Ashkelon prison where her husband is held the day before. They violently attempted to force the impossible — to make the hunger strike end. I couldn’t hide my tears anymore, despite trying so hard not to let them fall. I didn’t know what to do to calm her down. The woman told me that she and all other prisoners’ families have been denied visitation rights since Hamas won the 2006 election. They hear nothing from their imprisoned family members, except rarely, when some miracle happens; like when someone from the West Bank visits relatives who are imprisoned with her husband. Then, her husband can ask the visitor to convey a message to her that he is doing well. I couldn’t say anything but for prayers that God provide her with patience and that her husband gets his freedom back soon. My father has always said that prisoners are the living martyrs. I think they really deserve this honor for all the injustice and suffering they endure. This open hunger strike of the Palestinian prisoners will continue until Israel addresses their demands. International solidarity is needed now more than ever. Everyone needs to wake up and do something. We shouldn’t let the cruel conditions of the Palestinian detainees last forever. This entry was posted on October 5, 2011 by Shahd Abusalama. 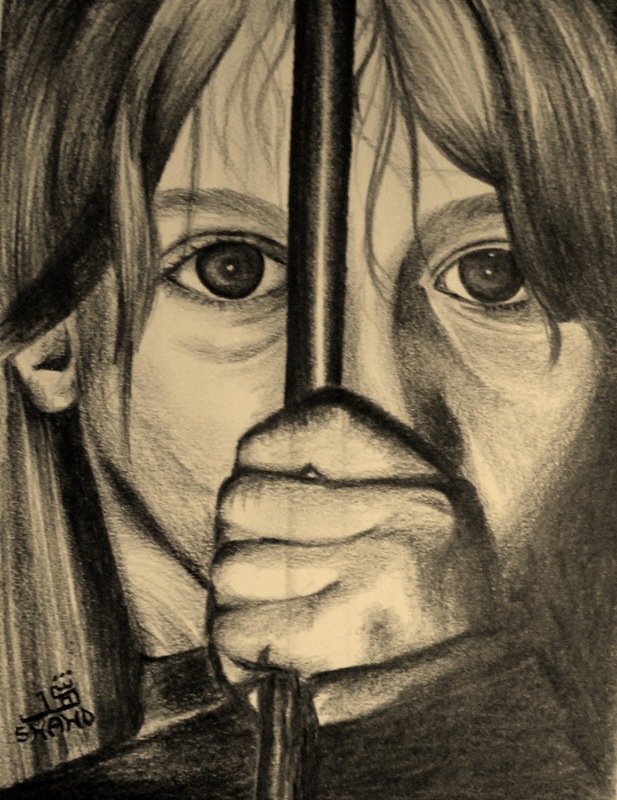 It was filed under My Drawings, Palestinian Political Prisoners, Stories from my father's life and was tagged with Drawing, Gaza, Ismael Abusalama, Israel, Israeli Prison Service, Palestine, Palestinian Political Prisoners, Palestinian prisoners, prison, Prisoners, Shahd Abusalama, Shalit, Swap deal. Wow. Powerful.Thats a whole different world that most of us will never imagine. Thanks so much for sharing that with me and opening up my eyes to those stories. …Hello. I read an article in the Italian magazine "Liberetà" talking about yourself and about the difficulties of life in Gaza. I leave a greeting from Buenos Aires, Argentina. I wrote to the Google translator, I do not write in English. Oscar. Without reports like yours we would never know the horrors faced by Palestinians…thank you. Irish media(as with most Western media)does not seem to think these atrocities are important enough to broadcast. Israel's vicious campaign of ethnic cleansing is unacceptable and we can only pray that global governments will eventually grow a backbone. We have a saying in Irish – "Tiocfaidh ár lá"- which means "our day will come"…I hope that this comes true for Palestine. My thoughts and prayers are with you.